Paul Sujan in the 1980s. Paul Ferenc Sujan was born in Poscony, Hungary in September 28, 1917. After the end of World War I, when Paul was a toddler, the newly created state of Czechoslovakia gained control of the northern region of Hungary, and Paul's family left as refugees for Budapest. During the journey, his five year old brother died. At age 16, Paul was a young Sea Scout and attended the 1933 World Jamboree held at Godollo in Hungary. Lord Robert Baden-Powell, the British hero of the Boer War and Chief Scout of the World, rode up to Paul's' camp and introduced himself. BP tasted some of the young man's stew, complimented him, and rode on to the next camp. This innocuous moment remained forever imbedded in Paul's mind and would inspire him in future years. In World War II, Paul served in the Hungarian Army as a lieutenant and later as a general's adjutant. There he gained a reputation as a man who could get things done. He likes to tell the story about how he would be given a job and he would rally the men together. He would give each their assignment and seeing the men go to work, would retire to his bunk and take a nap. During WWII, Paul lost his only living brother Zoltan, who died while defending Budapest. After World Ward II ended, Russian forces moved to occupy Hungary. Paul Sujan's entire unit, under attack by the Russian army, sought aid and security in Austria and then Bavaria from the Western Allies. The unit was briefly imprisoned before they were granted amnesty by the governor of the Bavarian Province, General George S. Patton. Paul married a German girl, Margarethe Maria Siepen, who he met while helping to care for wounded and ill comrades in a facility provided by the Allies. In 1951 Paul, Margarethe and their three children, Sibylla, Zoltan and Andrew, emigrated to Los Angeles, California. Five years later, having secured a good job with a union, he at first resisted other's encouragement to teach Hungarian at the newly formed Army Language School in Monterey. However, he was finally persuaded to try it out for six weeks. He found he liked it and moved the entire family, now including Peter and Andrew, from Los Angeles to join him. At the Army Language School, he met fellow Hungarians and Scouters Béla Bánáthy and Joe St. Clair. Remembering his boyhood inspiration from Baden Powell, he joined their efforts and began to serve the community through Scouting shortly after his arrival in Monterey. 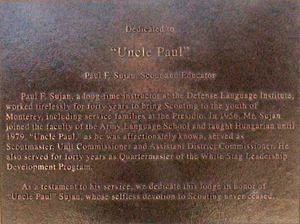 Paul Sujan (Sr.) was a Hungarian language instructor at the Army Language School, later the Defense Language Institute, for 25 years, from 1956 to 1979. 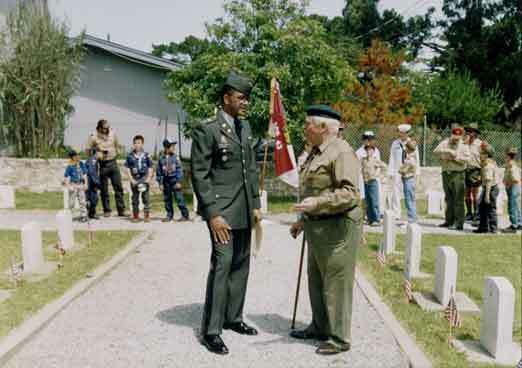 On Memorial Day, 1993, as he did every year, Paul taught Cub and Boy Scouts to honor veterans who sacrificed their lives for our freedom by placing United States flags on the graves of veterans in the Presidio of Monterey cemetery. While in Monterey, Paul and Margarethe had two more children, Margarete Johanna and Paul Kalman. 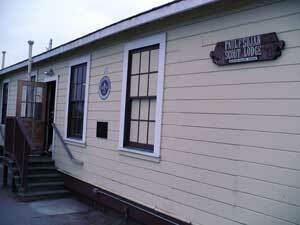 He continued to use his organizational skills to help youth in Scouting on the Presidio of Monterey. 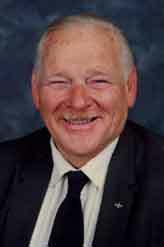 He served as Scoutmaster, Unit Commission, and Assistant District Commissioner. Most memorable to many of us is his constant presence as Quartermaster during White Stag Leadership Development camp every summer from 1957 to 1996. When I was a boy aged 13, he watched my care of his beloved pots and pans like a hawk, and made darn sure I scrubbed them sparkling clean before we could turn them in at the end of camp. When I was Program Director 11 years later, he just as vigilantly oversaw all of the equipment and program resources. He saved twine, fabric, anything of any use, and if you needed it, he could find it and produce it for you in short notice. He was a ready source of materials for your patrol flag, and proudly each year ran a long line of flags from past year's patrols around the Quartermaster's shack. The Paul Sujan Scout Lodge was dedicated in October 2003. The plaque dedicating the Lodge to Uncle Paul. He received numerous citations and letters of appreciation for his continued, selfless devotion to helping community youth. He was awarded Scouting's highest honor, the Silver Beaver, by the Monterey Bay Area Council in 1963 and was selected as Distinguished Commissioner. He received the Defense Language Institute's Coin of Excellence Award. Uncle Paul, as everyone knows him, could procure almost anything. When arrangements needed to be made, he knew who to talk to and arrangements were made. He single-handedly took over management of the Presidio of Monterey Arts and Crafts building and turned it into a Scout Lodge, hosting uncounted Scout meetings and events over several decades. Though never a driver, he was always driven, working behind the scenes to facilitate Scouting for service members and their families. For these many accomplishments, the community is extraordinarily grateful, and dedicated the Paul F. Sujan Scout Lodge in September, 2002.Although silenced by a stroke and unable to speak, he was visibly moved when he attended the ceremony during which a permanent plaque honoring his years of service was placed on the Scout Lodge in October, 2003. Uncle Paul passed away on December 12, 2003 at age 86 after a lingering illness following a stroke several years previously.